For 2018 as a whole, both sales in the Trade Sector, which comprises Wholesale Trade, Retail Trade and the Sale & Repair of Vehicles, and sales in other Market Services recorded positive results, with increases of 1.9% for the Trade Sector and 2.0% for all other Services, all in real terms according to EUSTAT data. The results for the fourth quarter of 2018 were also positive. The Trade sector saw sales increase by 1.3% in the fourth quarter of 2018 in constant terms, whereas the sectors that come under Other Services saw an increase in sales of 0.6%, all in relation to the same quarter of the previous year. The Trade sector rose by 0.3% compared with the previous quarter, whilst Other Services saw a decrease of 0.7%, at constant prices and once any seasonal effects had been eliminated. Within Trade, the year-on-year trends have been positive for Retail Trade sales, up 3.3%, and for the Sale & Repair of Motor Vehicles , with an increase of 1.1%, whilst Wholesale Trade sales fell by 0.3%. In the Other Services section, in constant terms, the Sales Index of the Transport & Storage sector rose by 3.9%, and for Scientific and Technical Professional Activities the Sales Index was unchanged compared to the same quarter of the previous year (0.0%); in turn, the sales index was down in the sectors of Administrative Activities & Auxiliary Services (-0.1%), Hotel Management & Catering (-1.1%) and Information & Communications (-1.9%). 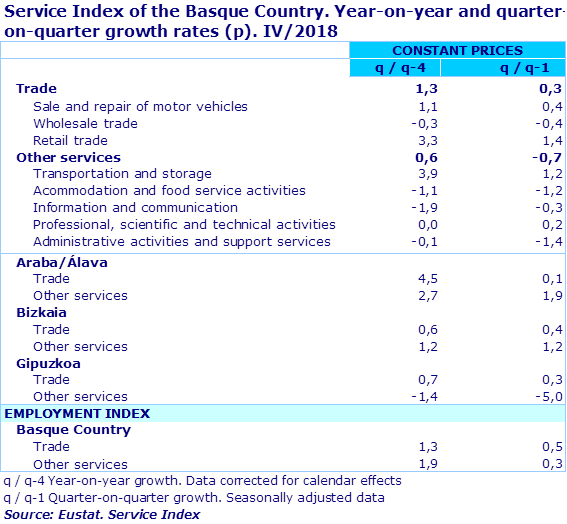 By province, Trade sector sales rose by 4.5% in Álava, with Other Services registering an increase of 2.7%; in Bizkaia, Trade grew by 0.6% and the Other Services sector saw an increase of 1.2% and, in Gipuzkoa, the Trade sector sales index went up by 0.7% and Other Services went down by 1.4%, all compared to the fourth quarter of 2017 and once the price effect had been discounted. 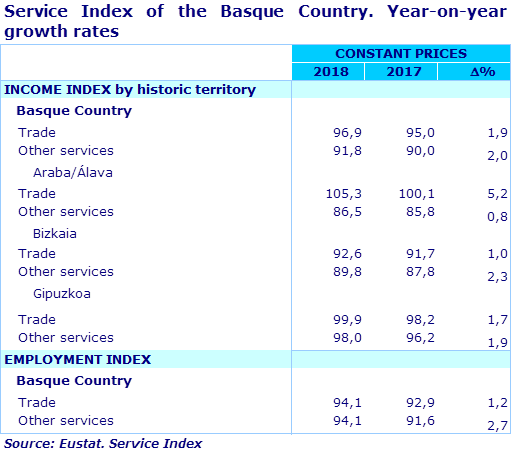 The index of employed people in the Basque Country rose on a year-on-year basis for both indexes, with a 1.3% rise in the Trade sector and a 1.9% increase in the index for Other Services. There was an accumulated increase of 1.9% in Trade sector sales and a rise of 2.0% in Other Services in real terms for the year overall. The Market Services sector performed positively in all three provinces. Trade sector sales rose by 5.2% in Álava, with Other Services registering an increase of 0.8%; in Bizkaia, Trade grew by 1.0% meanwhile, the Other Services sector saw an increase of 2.3%; and, lastly, in Gipuzkoa, the Trade sector sales index went up by 1.7% with Other Services also rising by 1.9%, all at constant prices. The number of employed people in the Trade sector was up by 1.2% in 2018, compared to the average of the previous year. The index also rose by 2.7% in the Other Services sector.